Tens of thousands of university and CEGEP students braved the cold on Nov. 21 to protest against unpaid internships. Coinciding with International Interns Day on Nov. 10, about 20,000 students from associations from Université du Québec à Montréal (UQAM), Université de Montréal and McGill University took part in the demonstration as part of their week-long strike against unpaid internships from Nov. 19 to 23. 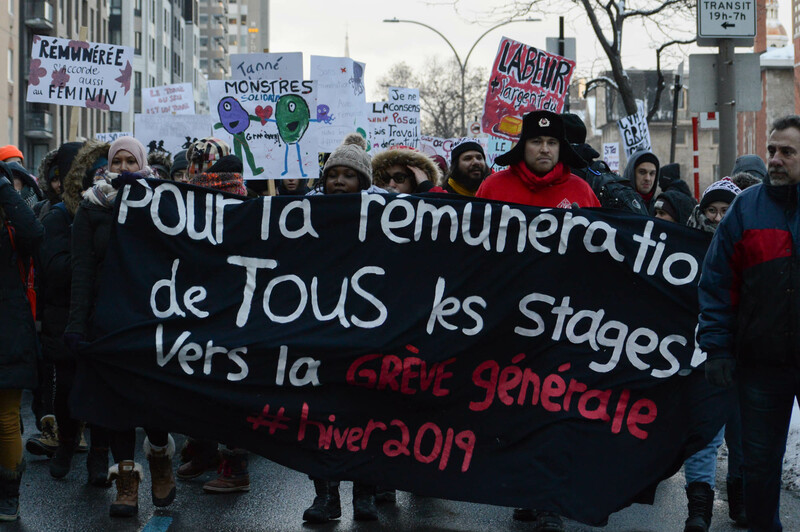 Jessica Mitchell, a worker at Campagne unitaire sur le travail étudiant (CUTE), said that multiple student associations announced the strike by voting in October during their general assemblies. The purpose of the strike was to demand that students’ work be recognized and remunerated. Many students from Cégep du Vieux Montréal, Collège Montmorency and Cégep de Saint-Laurent were also present at the demonstration. The event began at 3 p.m. at Place Émilie-Gamelin, next to the Berri-UQAM metro. According to Forget, the biggest challenge many education students face is that they often aren’t allowed to work part-time jobs in addition to their internship because of concerns that the students won’t be able to fully commit themselves to the internship. According to a survey conducted in 2017 by the committee for the remuneration of internships at the l’Université du Québec en Outaouais, heavy workloads that students often carry during internships can have unhealthy impacts. Twenty per cent of survey respondents said they felt overworked, were sleep deprived and experienced a difficulty in balancing work, internship, studies and personal life. In addition, 42 per cent of respondents reported experiencing anxiety, isolation and psychological distress during their internship. According to UQAM’s education department’s student association, about 84 per cent of interns in the education field are women. Forget added that many unpaid internships are in female-dominated fields, such as teaching, social work and nursing. “It’s a feminist strike because we see that fields for women are being exploited,” she said. Mitchell said that this is an issue of sexism because internships in predominantly male fields, such as engineering and computer science, are often paid whereas those often geared toward women are not. “People will often say that interns are supposed to be learning and you should not be paid to learn,” Mitchell said. Mitchell added that unpaid internships are becoming more common in Quebec due to the competitive nature of many fields. “Some students are expected to boost up their resumes through unpaid internships,” Mitchell said. Although many students have called for an unlimited general strike in January 2019 if the government does not implement changes, Mitchell said that this is not necessarily set in stone. “We will hold general assemblies among student associations and vote to decide whether or not we will go on strike or not,” she said. John Hutton, the finance coordinator for the Concordia Student Union (CSU), also participated in the march, and said that the CSU is in favour of the strike. “There are a number of students at Concordia who have to deal with this as well, and we are here to support them and say that all work should be paid,”he said.